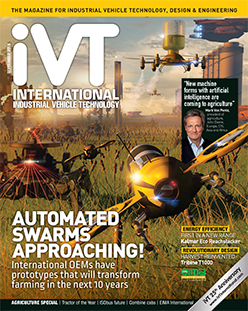 Download the IVT International App NOW to read the latest issue! The App is free and gives you access to a library of back issues. SWARM WELCOME? : Agricultural robots using swarm intelligence have been discussed for at least two decades, but now, with at least one major OEM going public with its technology, could the time finally be right for real-world deployment? THE INSIDE STORY : Combine Harvesters do work that demands some of the longest hours on any farm, so their cabs are at the cutting edge of ergonomics and comfort. IVT takes a look at three of the best. REDS VS YELLOWS : What makes a construction vehicle different from an agricultural one? Some comparable wheel loaders in the Schäffer range differ only in paintwork, but others have key design features tailored to their target markets. MARK VON PENTZ : In a frank discussion, Mark Von Pentz – president of John Deere’s global tractor platform and its entire agricultural and turf division – charts his career at the company and looks forward to the disruptive technologies of the near future.